How do you cope when faced with complexity and constant change at work? Here’s what the world’s best leaders and teams do: they improvise. They invent novel responses and take calculated risks without a scripted plan or a safety net that guarantees specific outcomes. They negotiate with each other as they proceed, and they don’t dwell on mistakes or stifle each other’s ideas. In short, they say “yes to the mess” that is today’s hurried, harried, yet enormously innovative and fertile world of work. This is exactly what great jazz musicians do. 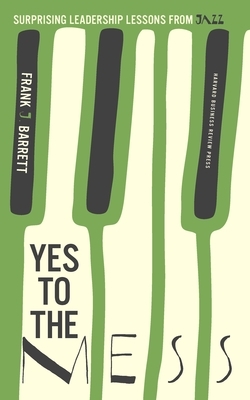 In this revelatory book, accomplished jazz pianist and management scholar Frank Barrett shows how this improvisational “jazz mind-set” and the skills that go along with it are essential for effective leadership today. With fascinating stories of the insights and innovations of jazz greats such as Miles Davis and Sonny Rollins, as well as probing accounts of the wisdom gleaned from his own experience as a jazz musician, Barrett introduces a new model for leading and collaborating in organizations. He describes how, like skilled jazz players, leaders need to master the art of unlearning, perform and experiment simultaneously, and take turns soloing and supporting each other. And with examples that range from manufacturing to the military to high-tech, he illustrates how organizations must take an inventive approach to crisis management, economic volatility, and all the rapidly evolving realities of our globally connected world. Leaders today need to be expert improvisers. Yes to the Mess vividly shows how the principles of jazz thinking and jazz performance can help anyone who leads teams or works with them to develop these critical skills, wherever they sit in the organization. Engaging and insightful, Yes to the Mess is a seminar on collaboration and complexity, against the soulful backdrop of jazz. Frank J. Barrett is Professor of Management and Global Public Policy at the Naval Postgraduate School in Monterey, California. He holds a PhD in Organizational Behavior from Case Western Reserve University and is an accomplished jazz musician. In addition to leading his own trios and quartets, Barrett has traveled extensively with the Tommy Dorsey Orchestra. His research interests and expertise include organizational change, social constructionism, organizational innovation, improvisation, and appreciative inquiry.